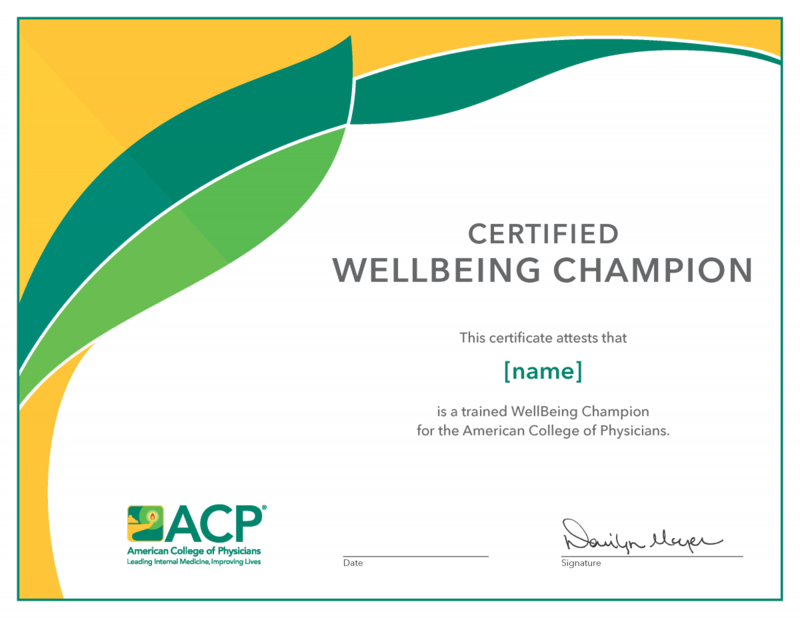 A key part of ACP’s Physician Well-being and Professional Satisfaction initiative is its chapter-based Well-being Champion program. The overall goal of the Well-being Champion program is to foster local communities of well-being by supporting chapter members, practices and organizations in addressing burnout and the conditions that create it. The Champions, who are trained ACP members passionate about ensuring the health and well-being of their colleagues, will strive to reach this goal through a variety of approaches tailored to the needs of the chapter and its members. A first small group of Champions was trained in 2015 and received “refresher” training in 2017. Now, as part of ACP’s commitment to physician well-being, a new cadre of up to 120 Well-being Champions will be trained in 2018 and 2019. Each participating chapter will have one or two trained Champions, each of whom will serve for an initial three year term. Contact your ACP chapter for more details.